Save money on energy use, while keeping your home comfortable. Energy saving is no longer just for greenies, with the typical family power bill has risen by 78% in less than a decade. The cost of simply forgetting to turn off your bathroom light and towel rail can really add up over time. Controlling temperature and lighting based on time of day or occupancy can really reduce energy costs. Automating your heating and lighting systems allows you to hand over the routine chores to a smart system and remove the cost of human error. Have your systems set automatically, or override the main settings with easy controls – Touchscreens, the Internet, web-enabled phones, or even the home telephone. Did you know that approximately 55% of a home’s energy use is spent on heating and cooling and approximately 15% for lighting? Home energy efficiency through automation can generate energy savings on all of these systems. 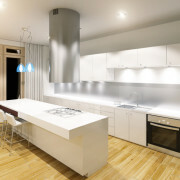 For example, studies show that dimming a light by just 10% can save 10% of electricity and double the life of the bulb. So you’re probably thinking “what else can I control?” Imagination is the limit, but how about electric blankets with time control, heated towel rails with time control, heating and/or cooling with temperature sensing… And how about your irrigation system? Have the home automation system take into account the rain data or weather reports – e.g. if its rainy in the next couple of days, it won’t turn on the irrigation. Further control is provided through temperature and humidity sensors for attics, garages, greenhouses, wine cellars, coolers, pools, and spas. In most of the above examples, you would save $$$ in power consumption as the human element is removed and the system will take control with pre-set programming. Another way to save on energy bills is by using LED lighting to retrofit any or all of your current lamps. By using LED lamps, the savings can be as high as 80%. The return on investment with regards to LED lamps is generally 3-5 years.